After “The War to End all Wars” ended, America experienced a post war economic boom commonly referred to as the “Roaring Twenties”. This economic boom went bust after the stock market crash of 1929. The serenity prayer arose to fame during this period of history. It was credited to a Lutheran Pastor and theologian named Dr. Reinhold Niebuhr whose life ( from 1892 to 1971) spanned the most consequential and profound eras of human history: The so-called “Great War,” which turned out to be the First World War; the Great Depression; and the Second World War. He often collaborated with Author/Evangelist Sherwood Eddy. On January 6, 1924, Reverend James R. Shepley began a lengthy pastorate in St. Paul’s history, spanning more than 24 years until his unexpected death on July 19, 1948. One can only imagine the number of folks that Rev. Shepley must have comforted during this difficult time. Rev. Shepley was devoted to St. Paul’s church and his congregation. In our church sanctuary, we have a large stained glass window donated by his family presented in loving memory of the Rev. James R. Shepley. Below is an oil painting created by Rev. Shepley as a gift to St. Paul’s Church. 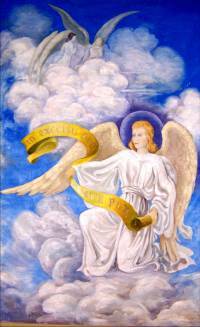 The banner held by the angel reads “In Excelsis DEO in terra Pax” – To God in the highest and on earth peace to men. On June 24, 1924, the Congregation approved the redecorating of the Church auditorium. In the Summer of 1928, Rev. Shepley was granted a leave of absence to travel to Europe on a missionary journey with the Sherwood Eddy Company. On July 1, 1932, a bid of $3100.00 was awarded to Dagostino and Pannanccio to rebuild the Church Tower. In 1934 our denomination, the Reformed Church in the United States, merged with the Evangelical Synod of North America, and our congregation became St. Paul’s Evangelical and Reformed Church. At the Morning Worship Service on June 6, 1943, the mortgage for the Church building was paid in full and burned. On December 3, 1944, at a special Congregational meeting, authorization was given to rebuild the pipe organ and redecorate the Chancel. On April 7, 1946, The Seventy-Fifth Anniversary was observed, as well as the rededication of the pipe organ and Chancel.